I have to admit, I’m no expert when it comes to brow maintenance. Like the majority of us, I was a perpetual overplucker in my teen years and have been struggling to grow them out a little fuller for the last couple of years. I’ve had them waxed (no thanks) or threaded a small handful of times before, but mostly am so ashamed of how rubbish my brows are that I recoil in horror at the thought of presenting them to a professional. Still, with emotional support in the shape of my wifey Sheenie in tow I headed down to Browhaus in Covent Garden last week to see if they could change my mind. 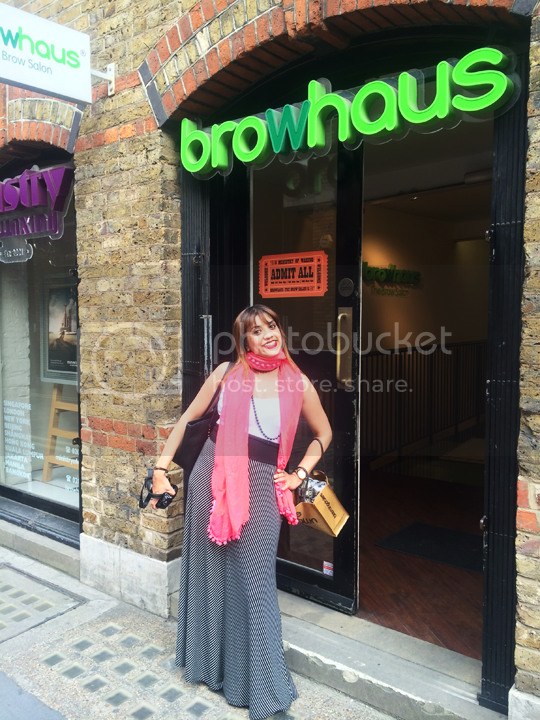 Browhaus is the world’s first and only concept store dedicated to brow and lash grooming, boasting stores across 8 major cities worldwide. Its only UK location is situated just moments away from both Covent Garden and Leicester Square tube stations, as part of a double-whammy one-stop grooming shop with the Ministry of Waxing on Floral Street. 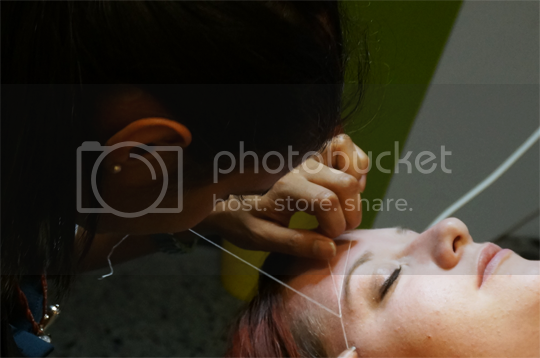 They offer a wide range of brow services from classic threading to tinting all the way through to semi-permanent brow enhancement – but no wax in sight. This can only be a good thing; as far as I’m concerned it should be illegal for wax to come within an imperial foot of anyone’s eyebrows. The service at Browhaus is thorough and attentive down to the last detail, including a glass of Prosecco when you arrive at the front desk. When it’s time for your treatment, you’re led down to a clean and comfortable treatment room with a bed – like I say, I’m no veteran but I’ve never actually laid down for a brow treatment before. My therapist, Priya, says that lying down allows much better access and more different angles compared with sitting up. Before your brows are touched with any thread or tweezers, your therapist will have a thorough consultation-style chat with you about what exactly it is that you want from your brows. Unfortunately I can’t magically make mine grow, but I was just looking for a bit more of a shape, something I can maintain myself between treatments that frames my face a bit more effectively than my scraggly excuse for brows do in their usual state. Interestingly, this consultation finally enlightened me as to what it is that makes my brows look weird – it’s not because they’re thin, it’s because they’re spaced too far apart. Annoyingly, no hair seems to grow any further in than it already does, but Priya (rightly) thought that a tidy up and a tint would make them far more presentable. Minutes later, Priya had performed some kind of miracle and used a combination of threading and tinting to transform me into someone who has what can legitimately be called eyebrows, and I couldn’t be happier. The before and after photos above hopefully go some way to illustrating exactly why I’m so pleased. Thank you, Browhaus! I was in and out of the salon within 30 minutes, so you can easily fit a treatment in without taking a big chunk out of your day. If you’re ever in the area, I highly recommend Browhaus and Priya in particular. The treatments are really reasonably priced for such great service, and new customers get 10% off their first treatment too. I’ll definitely be back – not just for upkeep on my lovely new brows, but for an eyelash perm too which I’m dying to try. What do you reckon – big improvement, huh? Do you think you’ll be counting yourself as a #BrowhausGirl soon? 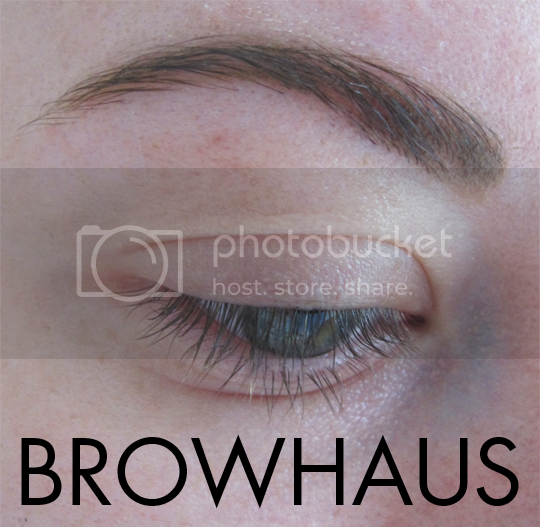 UPDATE: Browhaus have very kindly offered an exclusive discount to Do Not Refreeze readers! If you book before 1st August 2014 and quote DNRF25% you will receive 25% off any treatment. How could you say no to that?